Dogpile is one of the older meta search engines developed by Aaron Flin. In 1999 Go2Net took over Dogpile and in August 2000 InfoSpace (now Blucora) merged with Go2Net. Dogpile has been working since 1996 and is well known, perhaps because of Arfie the mascot who has been on the side from the beginning. 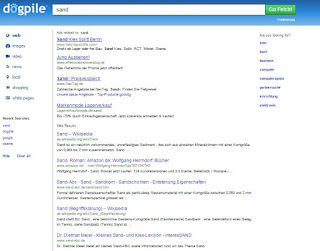 In the beginning Dogpile worked as a multi search engine, which provided the results of three search engines separately, without mixing them. Besides Yahoo and Altavista, they searched in sources like Usenet and ftp search engines. Today, Dogpile is a typical meta-search tool that combines the results of other search engines and offers them in a single results list. Home Page: You'll see Arfie on the front page, and get used to seeing this little pooch along with cutesy dog sayings everywhere ("go fetch"on the toolbar, for example). The home page is relatively clean and uncluttered, with a good choice of colors. The search bar is squarely in the middle of the home page, with textual tab choices right on top of that. Below Arfie, there are links to the Toolbar, Joke of the Day (it's a popup), SearchSpy, a way to view either family-friendly or unfiltered real-time Web searches, Maps, Weather, and an option to add Dogpile Search to your site. 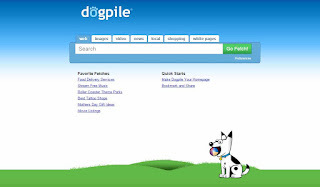 Chris Sherman, Jan 1, 2003: »Dogpile, the meta search engine with the goofy name, was one of the first net services to fetch a wide variety of documents and file types. Flin decided to write a meta search engine that searched multiple sources simultaneously, presenting results from three sources at a time. In a posting to the alt.internet.i-box Newsgroup on December 28, 1996, Flin wrote: "Please check out http://www.dogpile.com/, a new meta- search tool I just completed. It searches through 20 web, Usenet and ftp search engines, 3 at a time, and returns the results to you on one page. If you get less than ten hits, it will automatically fetch results from three more search engines. Dogpile wasn't the first meta search engine. Savvy Search, written by Colorado State University graduate student Daniel Dreilinger, had been around since March of 1995, and Metacrawler, developed at the University of Washington by then graduate student Erik Selberg and Associate Professor Oren Etzioni, was announced on July 12, 1995. "It has many features such as the use of AND NEAR and NOT connectors, reformatting the query to match the search engine and follow up links for each search engine if more hits are available." In August of 1999, Go2Net acquired Dogpile for $55 million in Go2Net stock and cash. The move was especially notable because Go2Net already had absorbed the web's most popular meta search service, Metacrawler, in November 1998. Acquiring Dogpile gave Go2Net a second popular meta search service. Why buy what Go2Net already had? To lock up the market. Just one year later, in August 2000, InfoSpace merged with Go2Net. InfoSpace continued to run both Dogpile and Metacrawler as separate services. Then in early 2002, InfoSpace acquired the Excite and Webcrawler portals for just $10 million. Over the course of this year, InfoSpace merged and unified the underlying technology powering Dogpile, Metacrawler, Excite and Webcrawler. Though each site maintains its own unique brand with distinctly different interfaces, all four are meta search engines powered by the same technology. »Dog Pile: A group of people jumping on on person and creating a tower of people while crushing the people on bottom. - If some one falls over everyone nearby jumps on him/her thus creating a dog pile. [...] A disagreement on an Internet message board wherein one person says something wrong or offensive, and a large number of people comment in response to tell the person how wrong and/or horrible they are, and continue to disparage the original commenter beyond any reasonable time limit. Wendy Boswell: »Searching with Dogpile: [...] I chose the term "landscaping", since that's on my mind these days. The search results page came back with combined results from the various search engines and directories that Dogpile pulls from, but there was another column to the right with the question "Are You Looking For..." that had MUCH better search queries and subsequently better results for a terraced back yard. You'll notice buttons at the top of your search results, including "Best of All Search Engines", "Google", "Yahoo Search", "MSN Search", etc. Click on any of those buttons and your search results will now highlight items that are specifically from that search engine in a column to the right. Unfortunately, this took away my Suggested Searches, and the only way I could get it back was to backtrack to my original search query.